Here we go - it is Christmas, the tradtional time of year to show off and brag with Christmas presents. My wife gave me a budget to spend on tea or tea ware. I asked Stéphane (Tea Masters Blog) for a tea pot that goes well with sheng puercha ... and I spent the entire budget on one little teapot, which arrived well in time. When the pot arrived in the middle of November (my wife likes to plan ahead and start in good time), I just checked if it had survived the shipping - which it had in good condition thanks to the good wrapping ... and protection by a load of tea sample packs. Merci Stéphane! Then I put it away and waited for yesterday evening. Gosh, that was a major act of patience - but I didn't touch the box untill yesterday, lest I break my gift before Christmas Eve. Yesterday evening I soaked the pot in cold water, brought it to a boil and let it cool down. Today was the great day: the first tea in my treasure pot. 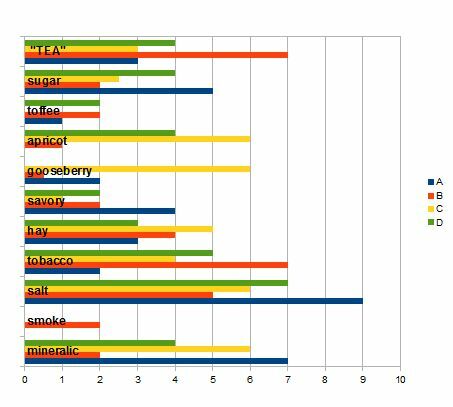 I thought about brewing some of the 2008 Mangfei, as I konw that tea quite well and might best detect, how the pot influences the brew. But I feel a cold creeping up with a sore throat, so I rather craved for something darker, which turned out to be the 2003 Mengku. 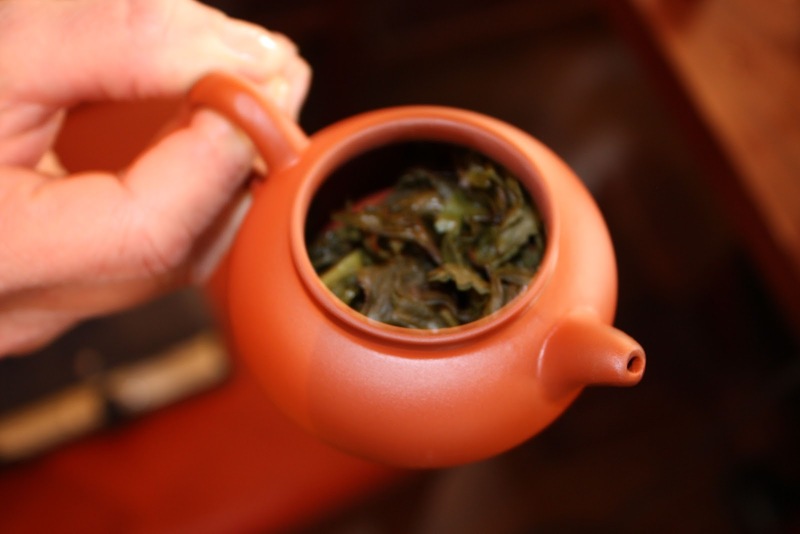 My first post on that tea in this blog states, how little nuanced it turned out when brewed in a claypot (which I usually brew baozhong and similar teas in). But today the tea was everything I wished for: so many different layers of flavour from old wood, potatoes, mint and even camphor. But the best about todays brew was the mouthfeel - I could almost chew on the tea, there was so much substantiallity to it. To cut my ramblings short: satisfaction in a tea was brought to a new level! At first I was a little worried - to empty the pot takes 15 seconds. As my usual steeping times in early infusions is shorter, I was afraid to overbrew the tea and used less leaves. But even when I got distracted and infusion 7 brewed for about two minutes, the tea turned out absolutely enjoyable and far from bitter. It seems like the clay transforms astringency to density, giving that 'substantial' note to the tea's mouthfeel. Can you identtify the potter's mark? Well - there is none. For a teapot costing my entire christmas budget, you might expect me to bragg on about the famous artist who produced it. But I don't know. And I don't care. It just delivers great sheng - exactly what I got it for. Without any claim on objectivity I think that this is the best Christmas gift I could get this year. How about you? Hope Santa was kind to you and gave you the right stuff for wonderful tea sessions. Merry Christmas everyone! Dear English speaking readers - please forgive me for not writing an English version today. Please bear with me and have a little patience. Hope to publish a translation this weekend. Update 25.12.2012: today I finally made the translation. Sorry to have kept you waiting for so long! Es ist kalt draußen - so richtig ungemütlich. Bei solchem Wetter trinke ich gerne dunkle Tees und heute fiel meine Wahl mal wieder auf meinen meist getrunken Shu Puer, nämlich den Mannong aus unserem Sortiment (Link zum Shop meines Arbeitgebers: click die Nr. 576). Wem der Ausdruck 'Shu' nicht geläufig sein sollte: dieser absolut empfehlenswerte Guide erklärt es unter Punkt 1.4. It is cold outside - wet, grey and unpleasant. In this type of weather, I prefer darker teas - and this time I chose the shu puer I drink most often: the Mannong found in our range (No. 576). In case you are unfamiliar with the term 'shu', you will find it here on Wikipedia. Wenn man diesen Tee richtig zubereitet, hat er nichts von dem kompostigen Geschmack und Fischtümpel-Geruch, der bei Billig-Shu dominiert. Viel mehr schmecke ich neben einer sehr angenehm erdigen Note etwas von Walnüssen und einen ganz zarten Hauch Vanille. Dazu kommt ein Mundgefühl, das mich immer wieder begeistert: fast als wäre Milch im Tee. Ein cremiges, seidiges Gefühl - aber ohne den Geschmack von Milch (der mir auch nicht zusagen würde). If you add a bit of TLC (tender loving care) to the brew, there will be no trace of compost or fish pond I loathe so much in cheaper shu. Rather I find (next to the earthy character - this is shu after all) the taste of walnuts and even hints of vanilla. But the best is the Mannong's mouthfeel - a creamy and silken texture, as if there was milk in it (but without the taste of milk which I don't like in tea). Wenn man sich meine Themen so ansieht, erkennt man einen deutlich Schwerpunkt beim Puer. Weil ich mich da so gut auskenne? Von wegen! Vielmehr ist es für mich die neueste Entdeckung in der weiten Teewelt, die daher viel Aufmerksamkeit von mir bekommt. 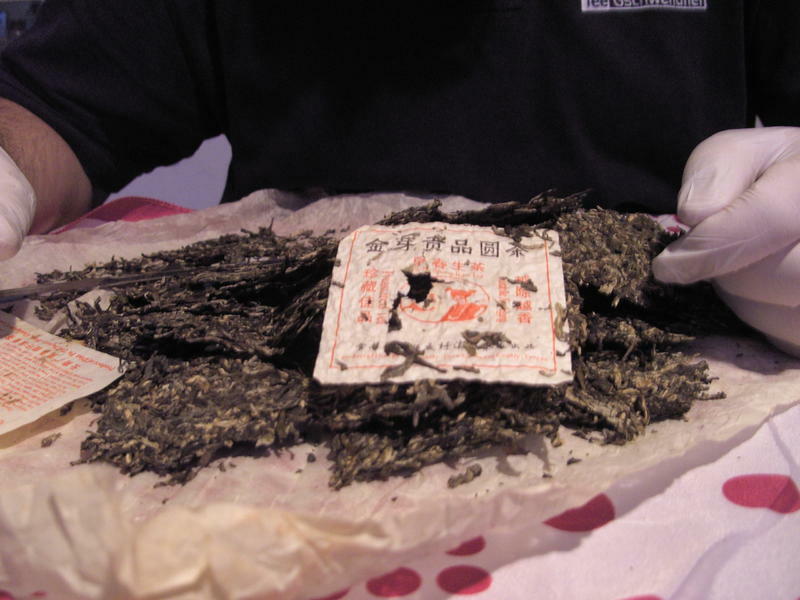 Looking at the topics of this little blog, you will find them mostly in the field of puer tea. Because I am so knowledgeable in it? On the contrary! As it is to me the newest discovery in the world of tea, it just gets most of my attention at the time being. Jahrelang mochte ich keinen Puer. Nein, das wäre eine Untertreibung - ich habe Puer verabscheut. Wenn ich gefragt wurde, welchen Tee man mir anbieten könne, war meine Antwort: "Alles Klassische - aber bloß keinen Puer!". Schließlich ist das doch dieses komische Zeug, für das guter Grüntee kompostiert wird. For years I didn't like puer tea. No, that would be too little to express my feelings I had - I utterly destested it! Whenever I was offered tea and asked for my preferences, I always replied: "Any unflavored tea - but no puer!". Afer all, that's the weird stuff made by composting green tea, right? Tja, über Jahre (Jahrzehnte) kannte ich nur Shu Puer - die Variante des Puer, für welche Teeblätter befeuchtet werden und dann zu Haufen aufgeschichtet eine mikrobielle Fermentation durchlaufen. Dieses Verfahren namens 'wodui' 渥堆 hat tatsächlich Ähnlichkeit mit Kompostierung. Wenn man es nett beschreiben will, kann man auf den Duft von Waldboden verweisen (indem auch grundsätzlich Laub kompostiert). Well, for years (decades) I only new shu puer - the type of puer for which the dried leaves are sprinkled with water and heaped to piles so bacteria and funghi can ferment the tea. This process called 'wodui' 渥堆 really resembles composting. To use nice words, the smell of shu puer resembles forest ground (which is a romantic place for leaves to rot). Aber nun trinke ich einen Shu aus Mannong (bei uns im Sortiment als Bio-Tee erhältlich) und genieße diesen Tee. Was ist mit mir passiert? But here I am, now drinking this shu from Mannong - enjoying it. What has happened? Als ich im letzten Jahr gezielt nach weiteren Infos über meine geliebten Oolongtees suchte, stieß ich auf Tea Masters Blog, The Half-Dipper und A Tea Addict's Journal - unheimlich informative Blogs, deren Schreibstile mich auch enorm ansprechen. So habe ich dann auch die Beiträge über Puer gelesen und so langsam Interesse an dem Thema entwickelt. Ich las von Sheng, der Vielzahl ganz unterschiedlicher Teeberge und der spannenden Frage der natürlichen Reifung. Meine Neugierde war geweckt! Aber weil wir keinen Sheng in unserem Sortiment haben, konnte ich meine Neugierde nicht direkt befriedigen. When last year I intensified my search for in depth information on my beloved oolong teas, I stumbled upon Tea Masters Blog, The Half Dipper and A Tea Addict's Journal - rich hoards of knowledge, written in truly appealing style. So I even read the posts on puer, as I could not get enough of those blogs. Thus I had a first glimpse at this wide field of sheng teas to be discovered - all those different tea mountains and the intriguing intricacies of natural ageing and maturation. I was hooked! But as we have no sheng in our range of products, I could not get immadiately started. Kurz zuvor war der Mannong neu in unsere Läden gekommen und ein Kollege sprach mich darauf an, ob ich nicht Interesse an Puer habe. Na ja, es fing ja gerade erst an - aber ihn beschäftigte das Thema sehr. Er hatte Besuch von einem Freund aus Russland, welcher dort wohl voll in der Puer-Szene steckte und meinen Kollegen etwas angesteckt hat. Also haben wir zusammen in der Teeküche unserer Büros mit den beiden Shu aus unserem Sortiment experimentiert. Shortly before the above happened, the Mannong was introduced to our range - and a colleague asked me if I was interested in puer. Well - it had just started to intrigue me, but we was diving in deeply. A friend of his from Russia (where that gentleman seems to be intimately involved in the puer scene) had infected him with accute pu-craving. So my colleague and I started doing enthusiastic experiments in the kitchen at our offices with the little puer-supply at hand: just two varieties of shu. Klingt etwas aufwändig für einen Bürotee, aber so kommt die Cremigkeit und der Walnussgeschmack am besten raus. In der Glaskanne sieht das Ergebnis aus wie richtig starker Kaffee ... so kann man die Kollegen schocken, wenn man das auf dem Schreibtisch stehen hat - in einem Unternehmen des Teehandels! Sounds to be a lot of bother for an office tea, but prepared like this (with TLC), the tea's creaminess and walnut flavor are most pronounced. In a glass tea pot the brew looks like really strong coffee ... great to dumbfound my colleagues, when they see it at my desk - in a tea trading company! Wie wichtig die richtige Zubereitung für den Teegenuss ist, brauche ich wohl nicht schon wieder zu erwähnen. Dass aber für die richtige Zubereitung die Geisteshaltung entscheidend ist, wurde mir heute zum Glück wieder klar. The importance of careful tea brewing is something I don't have to repeat. But today I would like to dwell on the set of mind / attitude which can be the main ingredient in brewing up a good cup. Es gibt bei Bannacha einen Tee von diesem Jahr, der aus Jinggu stammt. Die Beschreibung hat mich neugierig gemacht, also habe ich bei meiner letzten Bestellung auch eine 20g-Probe diesen Tees geordert. At Bannacha there is a tea of this year's spring from Jinggu. The description made me curious enough to include a 20g sample in my last order. Zuerst habe ich mir den Tee mal als Begleitung für einen Abend der Internetrecherche gemacht. Nebenbei getrunken, um einen ersten Eindruck zu bekommen - so wollte ich ein Gespür dafür bekommen, wie die Eigenschaften des Tees so sind und wie ich bei einer richtigen Gongfucha-Sitzung das Optimum aus dem Tee heraushole. My first go with this tea was very simple: just a casual tea to keep me company while searching the internet for deeper sheng knowledge. It was intended to be a first get-to-know, so I would get an idea of how to best brew this tea in a gongfucha session. Bei der ersten richtigen Sitzung habe ich viel Tee in meinen Gaiwan gepackt und den Tee kurz ziehen lassen. "Ganz nett" dachte ich mir ... bis zum vierten Aufguss, mit dem der Tee rapide in die Belanglosigkeit abdriftete. In that first gongfucha session my gaiwan received a heavy load of tea leaves for very short infusions. 'Quite nice' was my impression - untill I reached the fourth infusion and the tea suddenly dropped to utter boredom. Aber der Tee muss doch mehr zu bieten haben! Nach dem Text von William auf Bannacha muss das ein ganz toller Tee sein - wie bekomme ich das nur in meine Tasse? Also habe ich dann noch einen Versuch gestartet mit schwächerer Dosierung im Tonkännchen. Da fiel der Tee dann über viele Aufgüsse sehr konstant aus - aber ohne jegliche Besonderheit. But there just has to be more to be found in this tea! According to William (Mr. Bannacha) it is something grand. Just how to get that into my cup? So I gave it another try: fewer tea leaves, brewed for longer infusions in a clay teapot. Prepared this way, the tea kept a constant level for many infusions ... but that level was free of any excitement. Nun wurde es eng - es war nicht mehr viel von der 20g-Probe übrig (wobei William die vermutlich recht großzügig bemessen hat). Also habe ich auf teetalk um Tipps gebeten. Now things got serious - there was not much left of my 20g bag (which probably held a very generous interpretion of 20g to begin with - thanks William!). So I asked for help on our German tea forum teetalk. Der Tee kam vom sehr kalten Dachboden, also habe ich einen Tipp aus dem Blog von Miss Tea Delight abgewandelt und die Blätter erstmal mit lauwarmem Wasser angewärmt. Dann mit heißem Wasser gespült und einige Minuten gewartet (Tipp von teetalk). Today was the day - my next attempt at getting this tea right, once again with a light leaf/water ratio. The tea was stored in our rather cold attic, so I adapted a hint from Miss Tea Delight and gently warmed the leaves with luke warm water. Then the leaves got a rinse and afterwards some minutes to unfurl. Den ersten Aufguss habe ich (für meine Verhältnisse) ungewöhnlich lange ziehen lassen, vermutlich eine halbe Minute. Trotzdem zeigte sich der Tee in der Tasse recht hell und schmeckte auch milde (aber angenehm). The first infusion got plenty of time (compared to other sessions) - I waitend for about half a minute before pouring the tea. Still the cup turned out quite light both in colour and in taste. Der Durchbruch kam mit dem zweiten Aufguss. Das war kein "wow", das war ein ausgewachsenes "WOW!". Farbe heller Bernstein Richtung Orange. Duft ist eine Aprikosenexplosion. Hart an der Grenze zum 'zu lange gezogen' … aber noch nicht ganz drüber. Somit ein enorm vollmundiger, dichter Tee mit einer deutlichen Tannin-Warnung: 2 Sekunden länger und es wäre vor Adstringenz ungenießbar. Ichi go ichi e 一期一会 : wenn es (auch beim Tee) immer nur den einen, unwiderbringlichen Moment als das einzig Reale gibt, dann ist dieser Aufguss vielleicht der beste Moment. Denn hier und jetzt ist der Tee seinen Preis wert. Ob der Charakter über viele Aufgüsse so bleibt, ist mir in diesem Moment egal – denn dieser Aufguss ist perfekt. Am Deckel erschnuppere ich jetzt, da er abgekühlt ist, neben der Aprikose auch einen blumigen Duft, wie von Veilchen. My original notes read something like: Colour of light amber with hints of orange. Fragrance is an explosion of apricots. Bordering on 'steeped for too long' ... but not quite beyond the realm of pleasure. Makes it a well rounded and bodacious tea with a clear tannin warning: 2 seconds more would render it undrinkable. Ichi go ichi e 一期一会: this means (not just in tea) that each single irretrievable moment is the only reality there is. Well, this infusion is a perfect moment. Here and now the tea is worth its price. If it stays like this for future infusions has become irrelevant - the present moment is all it should be. When cooled a little the gaiwan's lid gives a fragarance of not just apricots but also something flowery - might be violets. 3. Aufguss: unverkrampft und entspannt bereitet, denn der Tee hat ja schon im 2. Aufguss so gestrahlt, dass ich damit schon zufrieden bin. 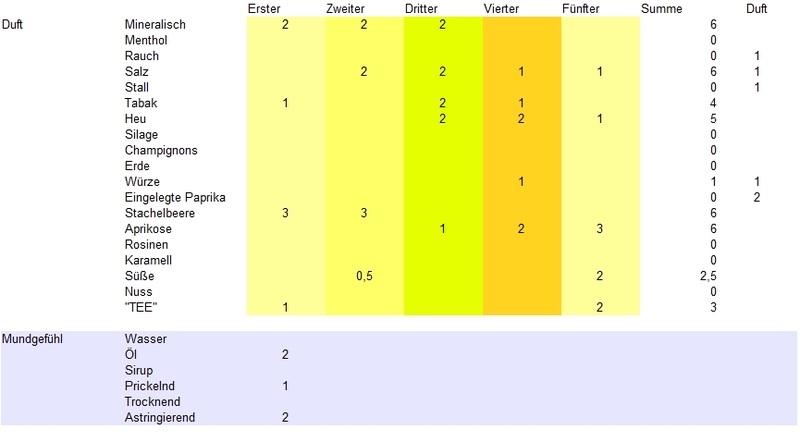 Da hatte ich überhaupt keine Erwartung daran, dass der 3. an den 2. heranreichen könnte. Konnte er aber! Ich hatte ganz vorsichtig aufgegossen, um die Blätter im Gaiwan möglichst wenig zu stören. Diese Respektsbekundung gegenüber den Blättern war wohl gut … und auch das 'wu wei'? 3rd Infusion: relaxed and easy preparation. As 2nd infusion had already yielded perfection & satisfaction, I felt no need to strain very hard. How could I expect another brew as fantastic as the previous? Anyhow - that was just how it turned out, pure bliss. When pouring the hot water, I did it slowly and gently, lest to disturb the leaves. This show of respect towards the leaves paid off ... and perhaps the wu wei. Kleiner Exkurs: der Daoismus ist ein Thema, in dem ich mich viel zu wenig auskenne. Aber ein Freund von mir (Ou Fuke, liest Du dies vielleicht?) hat mir mal von 'wu wei' erzählt: dem "Nicht-Handeln" - was keine Inaktivität beinhaltet, sondern das unverkrampfte und natürliche Geschehenlassen beschreibt. Please bear with a digression: daoism is a topic which I know precious little about (hardly anything). But a friend of mine once told me about 'wu wei 無為 ': 'non-action' - which is not about inactivity, but describes letting things happen naturally, without much deliberation. Mit dieser Einstellung ging es weiter. Auch die nächsten Aufgüsse wurden nicht nach einem genau ausgetüftelten Schema zubereitet, sondern aus dem Bauch heraus kam es mir richtig vor, das heiße Wasser ganz vorsichtig und langsam über die Wand des Gaiwan aufzugießen. Auch die Ziehzeit folgte rein der Intuition und dem Duft des Gaiwandeckels. Wenn der Duft gut war, habe ich abgegossen. Das funktioniert natürlich nur, wenn man sich ganz dem Tee widmet ("sich konzentrieren auf" klingt mir da schon wieder zu verkrampft). Also habe ich keine Musik gehört, nicht im Internet rumgesucht, sondern einfach nur ganz aufmerksam den Tee genossen. In that frame of mind the session continued. The ensuing infusions were not conducted in accordance to any strict plan, but just happened naturally. Guided by the feeling that I should not interrupt the leaves in doing their magic, I kept the pouring to a very gentle movement - adding water to the gaiwan slowly on the side. The infusions' timing was also guided by intuition and by checking the gaiwan's lid for the right fragrance: when I found it, it was time to pour the tea. No clock, no counting the seconds. This works only if you dedicate your full attention to the tea. No music, no internet - just the tea and me. So bekam ich 14 wunderbare Aufgüsse. Die Süße stieg und ebbte ab - mal war mehr Aprikose und später mehr Champignon im Geschmack. Aber jedes Mal ein enorm lebendiges Mundgefühl und ein sehr langer Nachgeschmack. Dazu ein Gefühl sehr wach zu sein, ohne mich aufgekratzt zu fühlen. For this relaxed mindfulness I was rewarded with 14 wonderful infusions. Sweetness came and receded; first apricots seemed to dominate the taste, later mushrooms prevailed. But each single brew gave a lively mouthfeeling and a lasting aftertaste. During the session I felt very much awake, without being exhilarated. Endlich habe ich den Schlüssel zu diesem Tee gefunden! Ich brauche keine bestimmte Methode mit präzise einzuhaltenden Schritten. Nach meinen ganzen Bemühungen, diesen Tee richtig zuzubereiten, war der Schlüssel einfach, die Bemühungen einzustellen. Vielmehr muss ich einfach nur dem Tee meine Aufmerksamkeit widmen und auf mein Bauchgefühl achten. Finally I found the key to this tea! No need to follow precise steps of an elaborate preparation. After all my struggling to get this tea right, the key was simply to stop struggling! I just had to give my attention / mindfulness to the tea and allow my intuition to guide the way. Kennt Ihr auch solche Tees, die nicht gleich auf Anhieb gelingen, aber dann um so leckerer werden? Have you had similar experiences - teas which didn't turn out right at first but then ended up being just great? P.S. bitte jedes "heute" gegen "gestern austauschen. Habe mal wieder viel zu lange gebraucht, um alles zu schreiben. P.S. please replace each 'today' with 'yesterday' - once again my ramblings took far too long to get everything written on the day of my tea session. Manchmal hat man Glück, wo man es nicht erwartet. Bei einem kleinen Asialaden fand ich zwischen koreanischen Nudelsuppen und Madras-Currypulver ein paar Schachteln mit Tee. Dabei waren wirklich interessante Sachen, z.B. Fenghuang Dancong - für mich einer der unkompliziertesten Oolongs. Heute habe ich mir den mal wieder vorgenommen. Sometimes you get lucky when you least expect ist. In a small Asian grocery shop I was between instant noodle soups and Madras curry, when I stumbled upon a shelf with some boxes of tea. There was surprisingly something much more interesting than PG Tips and Gunpowder: Fenghuang Dancong - to me this is one of the easiest Oolong. Today I picked it for a relaxed session. Trockenes Blatt: schmal gerollte, lange Locken - das sind "Schwarze Drachen", wie der Name Oolong es verheißt. Dry leaves: slender and long curls - these might be the 'Black Dragons' which gave the name Oolong. Duft im vorgewärmten Kännchen: fruchtig-süß wie Pfirsiche und Trauben. Kaum Röstnoten aber auch eine ganz leichte Würze wie von Zimt. Betörend! Fragrance in preheated pot: fruity and sweet like peaches and grapes. Hardly any toasty notes but there are some hints of cinnamon. Enticing! Geschmack: zuerst eine mineralische Wucht, die vielen vermutlich zu bitter erscheinen mag. Aber gleich nach diesem Schock nehme ich die fruchtige Süße war, die der Duft im Kännchen versprach. Die mineralische Herbe ist zwar nicht auf Anhieb so sympathisch wie das Fruchtige, aber da ich auch Wuyi-Tees gerne sehr stark dosiere und kurz ziehen lasse, habe ich mich an diese mineralische Note schon so gewöhnt, dass ich sie von dunklen Oolongs erwarte. Hätte dieser Tee von Anfang nur fruchtige Süße, wäre er in meinen Augen wohl ein Mädchentee. Taste: up front there is a mineralic Power (fully justifying the capital letter), which might seem far too bitter for casual tea drinkers. But right behind this jolt my mouth is filled by the sweet fruitiness promised by the teas fragrance. This mineralic bitterness is not as welcoming as teh sweet fruitiness, but as I am used to brewing Wuyi teas rather strongly (using flash-steeps), I have become so accustomed to (and fond of) this mineralic impression, that now a tea without it would not meet my expectations. If this Dancong would present only fruitiness, I'd consider it a girly tea - nothing I crave. Vielleicht mal ein paar Worte zu dem Kännchen: es ist ein Flohmarktfund aus Bangkok - das gute Stück ist in meinem Rucksack noch eine Woche durch Thailand und dann 6 Wochen durch Japan gereist. Danach hat sie (bislang) 20 Jahre unbeschadet bei mir überstanden - das ist eine noch viel schwierigere Prüfung. So etwas schweißt zusammen! Wenn man sich die Oberfläche genau ansieht, erkennt man die Naht, wo die Hälften der Gußform zusammenstießen - ist also kein kunsthandwerkliches Einzelstück. Auch sind bei den meisten Bloggern diese aufwändig dekorierten Teile meist verpönt. Aber ich ich liebe sie trotzdem! Nicht nur wegen unserer langen & innigen Beziehung, sondern auch wegen der Hauptsache: sie macht richtig guten Tee! Wuyi-Oolongs und auch Dancong werden runder und nuancierter, wenn ich sie nicht im Gaiwan sondern in diesem Drachenkännchen mache. Perhaps I should write a few lines about the teapot I used for this session: it was a find on a street market in Bangkok's china town. It travelled in my backpack for one week through Thailand and 6 more weeks through Japan. But the major test of its durability are the 20 years in my possesion which have passed since then. (I might be a candidate for the title of "Pottery's Bane - Slayer of Lids"). A fate like this binds very close ties! A close scrutiny of the pots surface shows signs where the mold's halves met - so it is not a unique piece created by a traditional artisan. And most bloggers look down at heavily ornamented pots like this one. Yet I am deeply in love with it! Not just because of our long lasting relationship - mostly because it brews really good tea! Wuyi oolongs and dancong turn out more nuanced and well rounded when brewed in my dragon pot - as opposed to preparations in a gaiwan. Zurück zum Tee: beim fünften Aufguss habe ich die Blitzinfusionen lange hinter mir gelassen und lasse den Tee nun (geschätzt) 2 Minuten ziehen. Die Süße ist schwächer, aber zusammen mit der (ebenfalls abgemilderten Mineralität) und einer beginnenden Adstringenz ergibt sich immer noch ein harmonsicher und lebhafter Tee. Back to the tea: at the fifth steeping these leaves are way past the point of flash infusions. Now the leaves steep for about two minutes and yield less sweetness. But in combination with a milder mineralic character and developing astringency it still delivers a harmonic and lively tea. Kennt Ihr das? Man gießt den Tee auf, wird abegelenkt und gießt nach etlichen Minuten erst den Tee ab. Meist ist der Tee dann ziemlich eklig. Aber nicht dieser im 8. Aufguss - mildwürzig, mit leichter Restsüße und einem total lebendigen Mundgefühl.Glück beim Einkauf - Glück bei der Zubereitung. Have you had such an experience? You pour hot water onto the leaves, get distracted and decant a few minutes later than usual. You'd expect such a brew to taste really nasty. But not this one at its 8th infusion: mildly flavourful with a lingering sweetness and an absolutely lively mouthfeel. Lucky buy - lucky brew. Der neunte Aufguss ist dann aber auch der Abschluss - süß aber flach. Zeit die Blätter zu bestaunen, die viel grüner wirken als der trockene Zustand erwarten ließ. Infusion no.9 marks the end - sweet but flat. Time to look at the spent leaves, which appear much greener than there dry state promised. Okay, das hier ist kein Spitzentee - der Vermarkter hat noch nicht einmal angegeben, welche Dancong-Variante es ist. Denn da gibt es unheimlich viel zu entdecken. Tea Obsession, ein Blog mit ganz starkem Schwerpunkt auf Dancong Tees. "A Tea Lover's Travel Diary", ein Buch von Chen Chiashen, z.B. hier bei Amazon. Tea Obsession, a blog mostly about dancong teas.